PARIS (AP) — A knife-wielding assailant killed a 29-year-old man and injured four others in a lively neighborhood near Paris' famed Opera Garnier before he was killed by police Saturday night. The Islamic State group claimed the attacker as one of its "soldiers." Counterterrorism authorities took charge of the investigation, and President Emmanuel Macron vowed that France would not bow to extremists despite being the target of multiple deadly attacks in recent years. Paris police officers evacuated people from some buildings in the Right Bank neighborhood after the attack, which happened on rue Monsigny at about 9 p.m. (1900 GMT.) Bar patrons and opera-goers described surprise and confusion in the immediate area. Beyond the police cordon, however, crowds still filled nearby cafes and the city's night life resumed its normal pace soon after the attack. The unidentified attacker targeted five people and then fled, according to Paris police and a witness. A 29-year-old man was killed, and four others were injured. When police officers arrived minutes later, he threatened them and was shot to death, according to police union official Yvan Assioma. Authorities are working to identify the assailant and anyone who might have helped him, Interior Minister Gerard Collomb told reporters Sunday. Prosecutor Francois Molins said counterterrorism authorities are leading the investigation on potential charges of murder and attempted murder in connection with terrorist motives. "At this stage, based on the one hand on the account of witnesses who said the attacker cried 'Allahu akbar' (God is great in Arabic) while attacking passersby with a knife, and given the modus operandi, we have turned this over to the counterterrorist section of the Paris prosecutor's office," Molins told reporters from the scene. The Islamic State group's Aamaq news agency said in a statement early Sunday that the assailant carried out the attack in response to the group's calls for supporters to target members of the U.S.-led military coalition squeezing the extremists out of Iraq and Syria. The Aamaq statement did not provide evidence for its claim or details on the assailant's identity. France's military has been active in the coalition since 2014, and Islamic State adherents have killed more than 200 people in France in recent years, including the 130 who died in the coordinated November 2015 attacks in Paris. President Emmanuel Macron tweeted his praise for police who "neutralized the terrorist" and said "France is once again paying the price of blood but will not cede an inch to enemies of freedom." Saturday's attack occurred near many bars and theaters, as well as the opera. France's BFM television interviewed an unnamed witness in a restaurant who said a young woman was at the entrance when "a man arrived and attacked her with a knife." A friend came to her aid and the attacker left, "hitting on all the doors, all the shops," the witness told BFM. He turned onto another street, and everyone scattered, the witness said. "I was having a drink with friends and we heard a boom," a witness named Gloria, who had been in a nearby bar, recounted on Saturday night. She said she went outside to see what happened and "I saw a guy lying on the ground." Another witness described leaving the opera house and being told to go back inside because of the attack. The interior minister said the lives of the four injured people are no longer in danger. Prime Minister Edouard Philippe said it took police less than nine minutes to subdue the attacker from the moment they were alerted. "This speed, calm and effectiveness allowed them to avoid ... a much heavier toll," he told reporters. 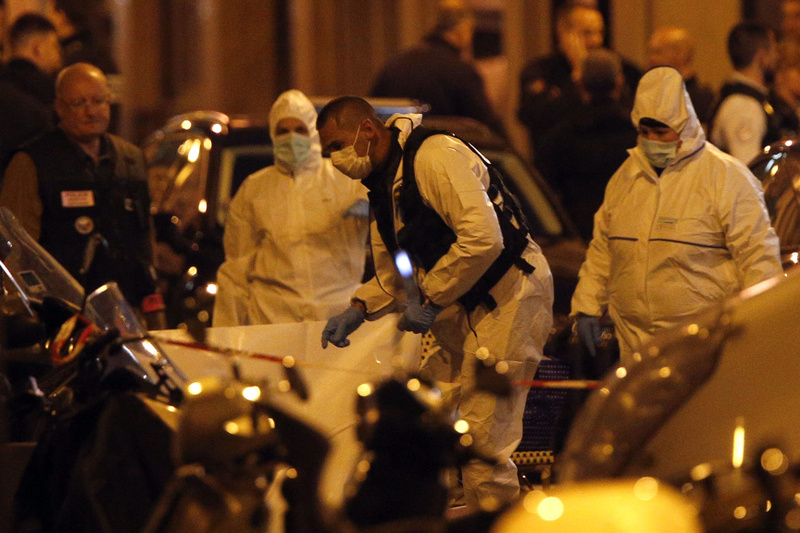 French police have been criticized in the past for failing to prevent attacks. Paris authorities called for calm and understanding. "Whatever the motivations of this odious act, let us remain united and standing," deputy mayor Bruno Julliard tweeted.